positive problem-solving experiences and more fun! Roche AB is the Swedish affiliate to the Roche group, the global pharmaceutical company Roche, headquartered in Basel Switzerland. Roche is active in over 100 countries and in 2017 employed about 94,000 people worldwide. Roche is a global pioneer in pharmaceuticals and diagnostics focused on advancing science to improve people’s lives and is the world’s largest biotech company. Founded in 1896, Roche continues to search for better ways to prevent, diagnose and treat diseases and make a sustainable contribution to society. Thirty medicines developed by Roche are included in the World Health Organization Model Lists of Essential Medicines, among them life-saving antibiotics, antimalarials and cancer medicines. For more information, please visit www.roche.com. It was clear to the top leadership that to compete in the market and continue to positively impact people’s lives with their products and services, the company needed to build a culture of creativity and innovation. Because of this, a cross-functional internal team—The Spark Team— launched the Spark of Creativity initiative. The Spark Team chose to strategically focus on improving the creative quality of meetings and collaborations within the organization because “too many meetings” and “unproductive processes” were a common concern. Spark and embed creativity in organizational meetings and encourage cross-departmental collaboration by introducing a range of creative techniques, tools and processes to the organization that would enhance or replace existing meeting styles and processes. Change perspectives and approaches about innovation such as the value of using playfulness to generate new ideas and being willing to see failure as an asset for learning and developing ideas. In preparation, the Spark Team consulted with experts such as Tobias Degsell from Combiner, IXY processes, Idea Nation, Open Lab and other Roche affiliates to determine a strategic focus. 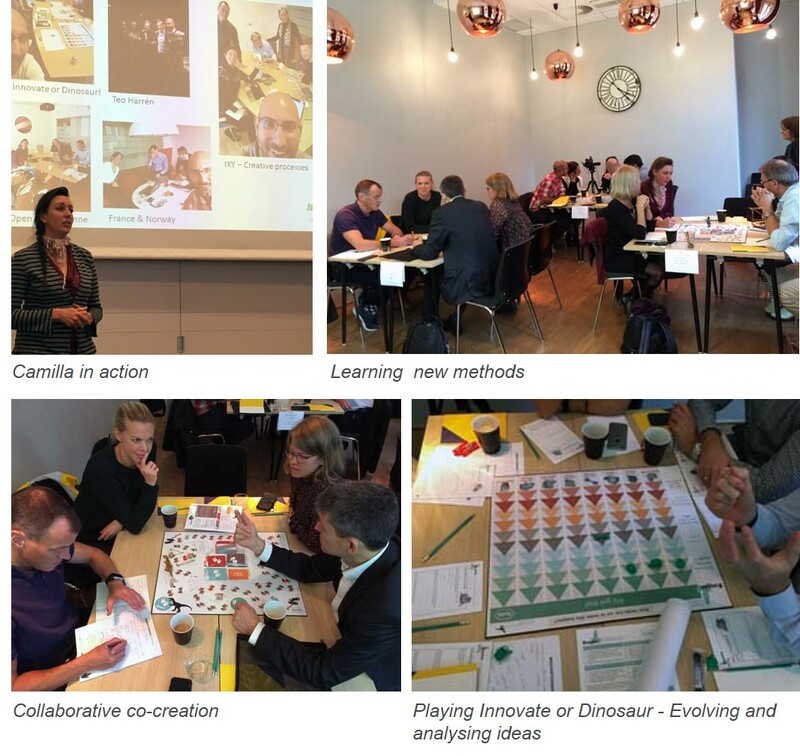 As a result, the team set out to disrupt the pattern of traditional meetings at Roche and chose innovation methods specifically for collaborative group process and playfulness – Hack-a-thons, Design Thinking, Innovate or Dinosaur “ID game”. To embed these creative methods into the meeting life of the organization, the Spark Team and an external professional facilitator from Traction, facilitated a series of 10 workshops between May 2017 and June 2018. These facilitated workshops varied from creative problem-solving sessions with 10 people to conference style workshops with over 100 people cross-team.